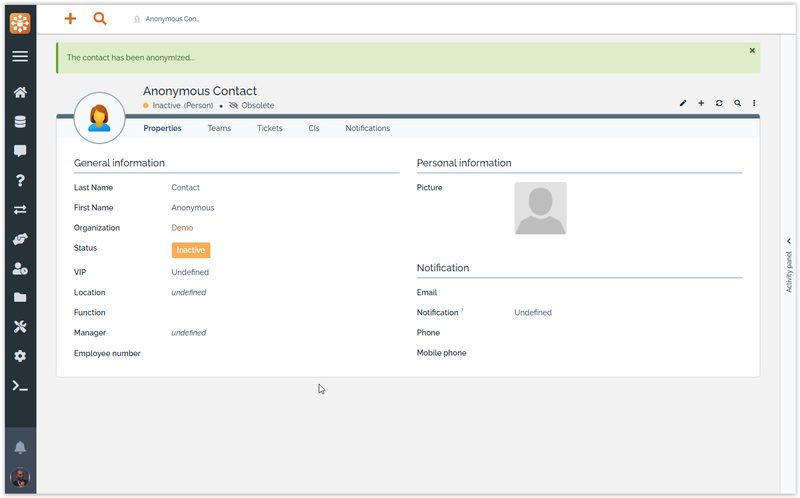 Helper extension to quickly anonymize Persons in iTop. 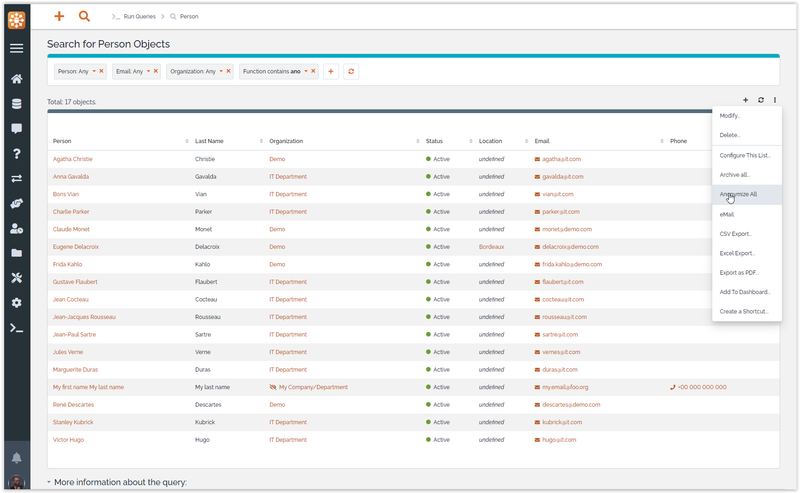 An helper extension to quickly anonymize Persons in iTop. Remove the personal data from a given person without deleting the Person object in iTop by “anonymizing” this person. 2018-07-04 1.0.0 First public version, fixes an issue in the menu creation for iTop 2.4.x. 2018-06-07 0.0.3 Bug fix: fixed the anonymization of case logs. 2018-06-06 0.0.2 Second version, compatibility extended to iTop 2.4.0. It is very difficult to guarantee an effective and complete anonymization of a person since the relations of this person can be used to (re) discover who this person was actually. What this extension performs is actually called a “Pseudonymization”. Unless you are dealing with sensitive data (medical records, credit card numbers…) such a pseudonymization is generally considered as sufficient to protect the personal data in a business context. 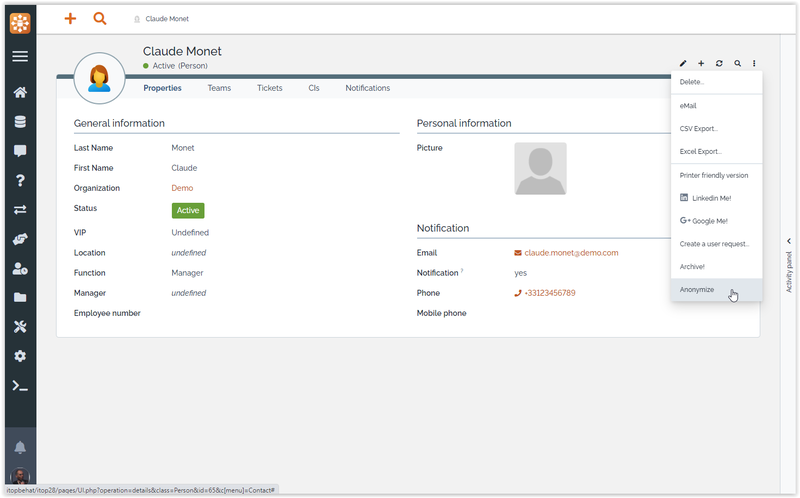 In the context of iTop, with extension such as Mail to Ticket Automation, the ticket description and caselog entries can contain the person signature, which will not be cleaned-up by this extension. A good practice would be to archive then delete Tickets related to anonymized caller. If you have two persons with the same name and you anonymize one, then history entries from both persons will be anonymized. If a person name changes, then history and caselog headers entries related to its former name will not be anonymized. 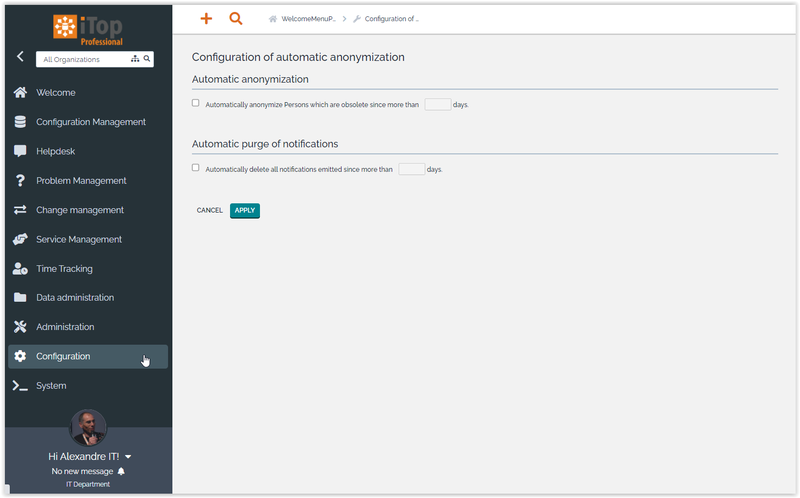 If enabled, the anonymization background task will run once a day and automatically anonymize the obsolete contacts based on the delay defined by the configuration, and delete all notifications, not only those which were sent to that person which are older than a number of days. This extension adds a new custom action “Anonymize” in the “Other Actions” menu on the Person class. The history entries (for the changes made by the user account associated with this person) are purged from the name of the person. If you have chosen (in the “Preferences” menu) not to display the obsolete items, the list of anonymized contacts will appear empty after the anonymization has been performed, because all contacts are now 'inactive' and thus marked has obsolete. clearing the history of the contact, with just one history entry remaining to indicate that this contact was anonymized. replacing the friendlyname of the contact in all CMDBChange records by its anonymized name. The extension adds several methods to the Person class. Since these methods are defined in XML you can easily alter / redefine them in XML. Anonymize(): This is the function called by the anonymizer extension. Unless you want to completely redefine the anonymization mechanism, you should not need to modify it. * Fill the mandatory fields of the current Person with anonymous values. * mandatory fields on the Person class. PurgeHistory($sOriginalName, $sAnonymizedName): this function removes all references to original name of the Person from the history of modifications and replaces them with the new anonymized name. CleanupCaseLogs($sPersonFriendlyName): removes the given friendlyname from all case log headers entries which where entered by this person. The change history contains only the friendlyname of the person who made the change. As a result, if you have two persons with the same name and you anonymize one, then history entries from both persons will be anonymized.